Secretary of State Hillary Clinton infamously presented Russian Foreign Minister Sergei Lavrov with a gift-wrapped red button, which said “Reset” in English and “Peregruzka” (“Overload”) in Russian. The prop, taken from a Jacuzzi or a swimming pool in Geneva, turned out to be quite symbolic. While the West naively looked the other way, Russia overloaded the world with the deluge of disinformation and propaganda. 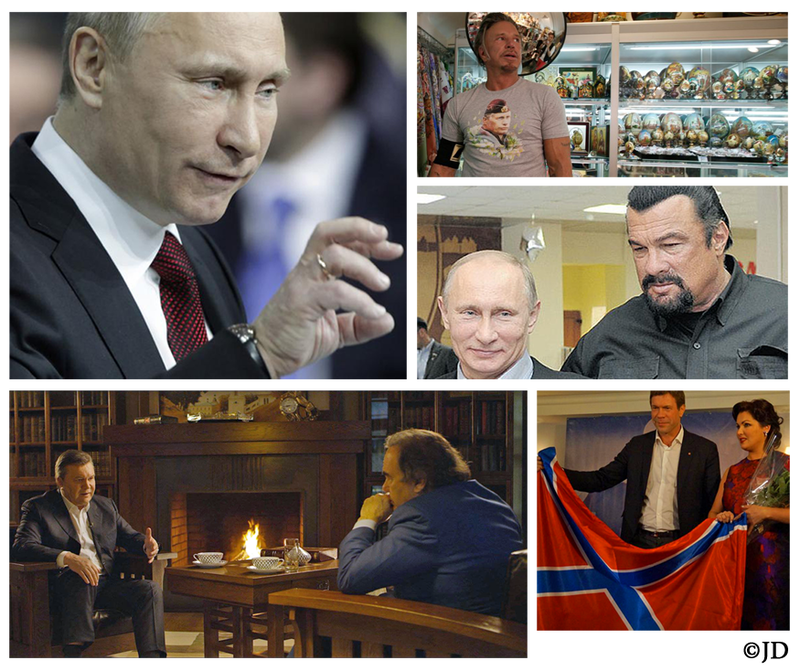 To achieve his objectives, Putin’s propaganda machine utilizes a number of tactics. Chief among them is seeking out chinks in the armor of the perceived opponent and penetrating their ranks to attack from within. Russia hires hordes of American lobbyists (including former senators), spends millions on Public Relations representatives and spares no expense to maintain the presence of Putin’s problem fixers in the West. PR firm Ketchum interacts with the New York Times, AP, Bloomberg, the Washington Post, Politico, CNBC, CNN, and PBS, promoting Russia’s interests. American oil giant, ExxonMobil, has multiple deals with Rosneft, worth upwards of $1 trillion. Russia’s richly rewarded business lobbies in the West use their connections with major media outlets to promote the talking points favorable to Putin’s agenda. Another old KGB tool actively utilized by Putin is recruiting Western filmmakers and artists to promote and justify Russia’s aggression towards its neighbors. It centers on the idea that people will be more receptive to the ideas espoused by their favorite celebrities. In December 2014, Oliver Stone cozily drank tea with the murderous former dictator of Ukraine, Viktor Yanukovych, who stole, transferred and squandered over $100 billion dollars from the country’s treasury. Stone proceeded to claim that Ukraine’s ‘Revolution of Dignity’ was just another CIA plot. This is not the first time Oliver Stone willfully helped to promulgate Russia’s agenda. His film, “JFK,” was based on Joachim Joesten’s book, “Oswald: Assassin or Fall Guy.” It was published in mid-1964, prior to the Warren Report and accused the CIA of assassinating President John F. Kennedy. After the fall of the Soviet Union it was uncovered that Joesten was a paid KGB Agent and the publisher Marzani & Munsell was a KGB Front. Lt. Gen. Ion Mihai Pacepa, the highest Soviet bloc official ever granted political asylum by the United States, revealed that the purpose of the KGB commissioning Joesten to write his book was to divert attention away from Oswald’s connections to the Soviet Union and Cuba. Oliver Stone made numerous appearances on Russian state media outlets, assuring the audiences that the Soviet state was above reproach in JFK’s murder. 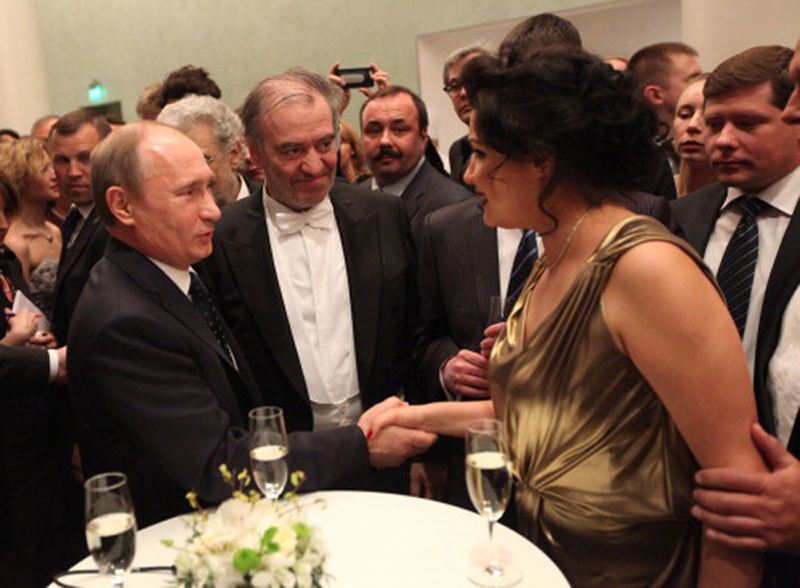 Putin uses his close personal ties to artists, such as Anna Netrebko, to promote his pet causes in the West. Famed opera singer held up the flag of nonexistent “Novorossiya” and posed with terrorist leader, Oleg Tsarov, after handing him a check for 1 million rubles. After Netrebko participated in the Russia-sponsored terrorist chapiteau, Austrian Airlines promptly decided not to renew her contract as the face of the airline. Metropolitan Opera and Chopard placed their financial interests above the star’s terrorist affiliations. 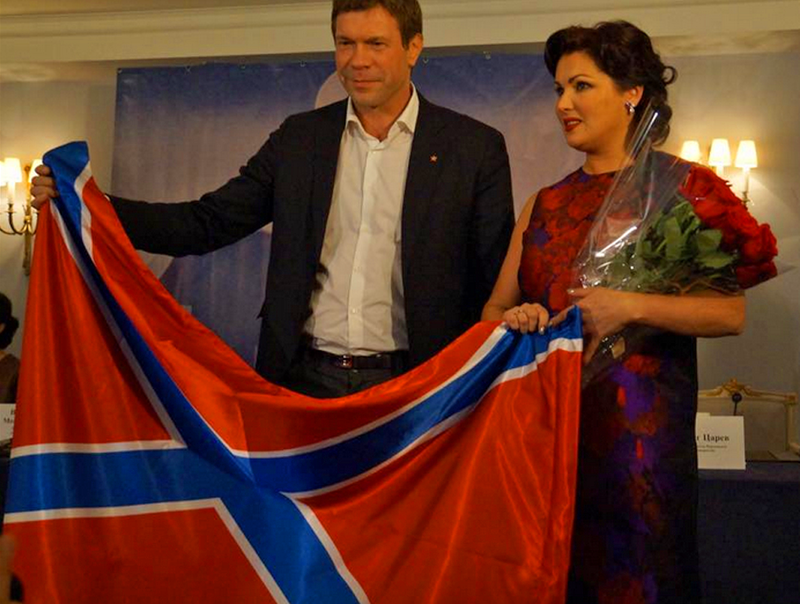 It should be noted that Netrebko does not live in Russia and recently acquired Austrian citizenship. Many children and wives of Russia’s leading politicians choose to live and study in the West. In addition to the outflow of Russia’s über-privileged elements, the brain drain from the country is astounding. 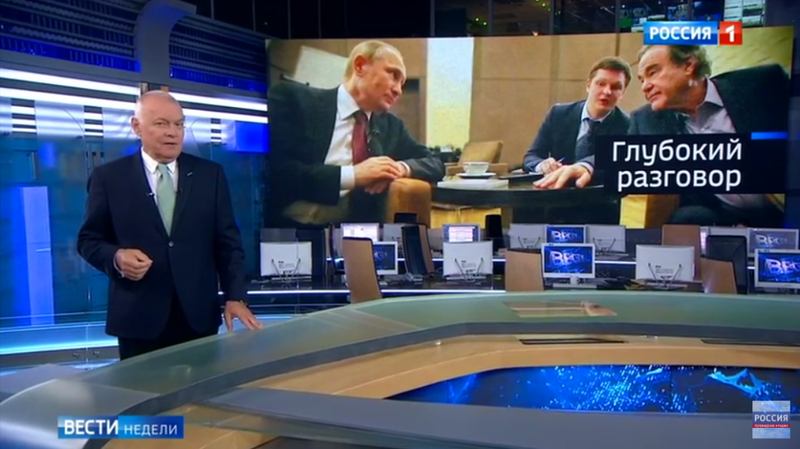 Russia’s crude propaganda obviously fails to impress its own intelligentsia. The low-brow promos, featuring faded movie stars like Mickey Rourke and Steven Seagal, thrill only the least sophisticated layers of Russian populace. Putin’s propaganda machine skillfully targets the disenfranchised elements of the Western society. Russia’s government-sponsored disinformation apparatus actively seeks out and oftentimes creates various conspiracy theories, while also capitalizing on valid concerns of government corruption and civil rights abuses. Due to the systematic oppression of government whistleblowers, Russian media offers to give them a platform to criticize the U.S. This access to the English-speaking Kremlin megaphone is not a selfless gesture. It exploits the hunger of the whistleblowers to finally have a voice, only to weave their statements into the patchwork of rabid anti-Western propaganda. Whistleblowers and those labeled as “conspiracy theorists” are eternally grateful to the outlets like Russia Today for telling their stories. In return, they believe and share everything else spouted by the deceitful network. Appearances of real whistleblowers are interlaced with unhinged commentary from fake “experts” and random low-level workers formerly employed by the government. The lack of knowledge about the region prevents Western fans of Kremlin programming from realizing that in Putin’s world they wouldn’t stand a chance. In Russia, the Occupy Movement would have been disbanded in one day and the likes of Oliver Stone would have been murdered for daring to criticize the government. In essence, Putin’s Russia is using the freedom of speech and expression in democratic societies in a brazen attempt to demoralize and destroy the West from within. The Russian propaganda tools not only capitalize on real instances of government corruption, but throw in an array of the black propaganda tools by inventing various conspiracy theories. In a great majority of Russia’s tall tales, the United States and the CIA are portrayed as the main culprits. Granted, the CIA’s reputation makes the agency an easy target. To shape public perceptions in Russia, its state media concentrates on a daily stream of negative news about the West, Ukraine and any other country that doesn’t blindly subscribe to Putin’s medieval ideals. Russia’s perceived foes are portrayed as corrupt, soulless, uneducated, aggressive degenerates and the West in general is depicted as a dying society on the brink of extinction. On the other hand, for external consumption, Russian media pretends to care about the issues that concern Western denizens. 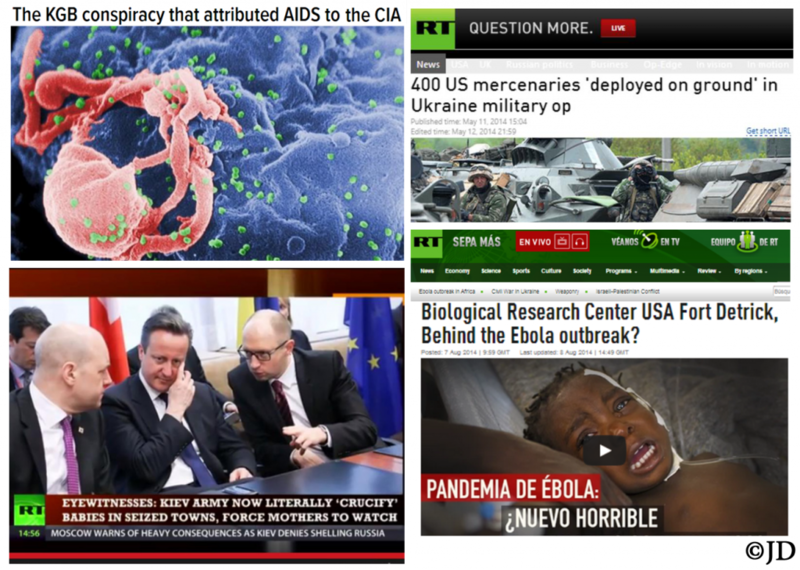 Under the guise of exposing corruption and shedding light upon various conspiracy theories, Kremlin-controlled Russia Today portrays itself as the beacon of truth and freedom. As shirtless Putin rides across the screen on a sad horse, misguided Western libertarians the world over see him as the “real leader” who cares about democratic values. In the meantime, Russian libertarians vehemently oppose Putin’s despotic kleptocracy and do their best to escape the tyrant’s clutches by leaving the country in droves. Until the West actively counteracts the menace of Russian propaganda, Putin and his tools of disinformation will continue to wreak havoc in the hearts and minds of gullible citizenry.